The kitchen is the heart of the home, so they say. If this is the room that you’re spending the most time in, then it deserves to be as bright as the memories you’re making, right? If you’re in the process of upgrading the lighting in your kitchen, then it’s important to know that it’s more than just the fixture that you need to think about. While style and aesthetics certainly play a part in the choice that you make, they shouldn’t be the only thing that you’re taking into consideration. What if we told you that your kitchen had different layers of lighting within it, would that make any sense? For many, the kitchen is the room in the house that has a confusing amount of light switches that when used in unison can brighten the room, but very few realize that each light fixture plays a role. By understanding the different role that each light fixture in your kitchen plays, you can better determine which light fixtures need to be replaced and which ones are doing their job. Let’s dive into the three light layers of your kitchen. Certain parts of your kitchen are dedicated to completing a task: cooking. Areas like your countertops or your island are going to have a lighting fixture that ensures these spaces are bright. The goal here is to ensure that while you are completing tasks (cutting produce, decorating pastries, etc. ), you can see what’s being done. The room that you’re cooking in was designed to make meals, but that doesn’t make it any less beautiful of a room. Every kitchen should have accent lights that add depth to the room itself. These types of light fixtures are often adjustable or in places where they can create dimensions in the kitchen. Now, some lights truly are intended to simply be decorative. Kitchen spaces are beautiful and given that they are one of the rooms where people spend the most time, they have some fun design elements as well. A few examples of decorative lights are chandeliers or hanging light fixtures that go above an eating area. These light fixtures aren’t there so much to contribute light, but they’re there to be an eye-catching piece within the space. 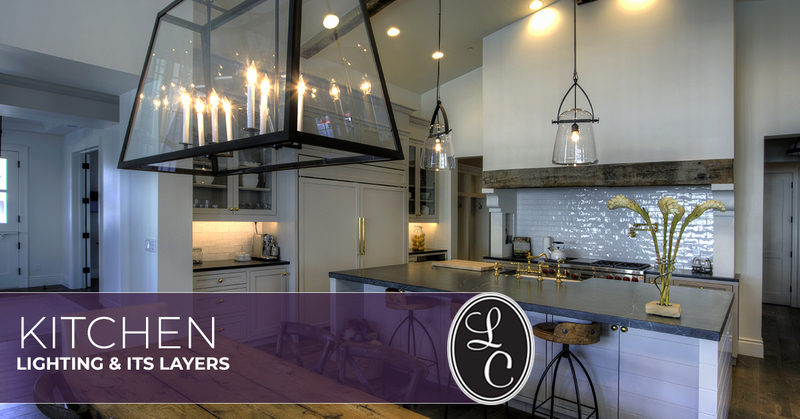 Now that you’ve learned more about the different layers of your kitchen’s lighting, it’s time to find the fixtures. You’ve likely recognized which one of these layers is lacking in performance, and now you can start to work towards a solution. Head on over to our lighting showroom in Trussville and talk to a member of our team about the lighting fixture that you’re looking for. With a general understanding of the lighting layer that you’re unhappy with and what your end goal with that lighting component is, our team should be able to direct you to a lighting fixture that offers a solution. Contact us today with any questions or browse our catalog of lighting products!